Canon caused a bit of a stir when it announced the 18.1 million pixel EOS-1DX because, rather unusually, it opted to use a sensor with a lower pixel count than the 21 megapixel Canon EOS 1Ds Mark III. The new camera also has a full-frame sensor rather than an APS-H sized unit, with a 1.3x crop factor, like the Canon EOS 1D Mark IV. As a result, some Canon EOS-1 series camera users were left scratching their heads and wondering about the benefits of upgrading. Canon EOS 1D Mk IV photographers stand to gain an extra 2 million pixels, but lose the extra reach that the 1.3x focal length magnification brings them, while Canon EOS 1Ds Mk III users suffer a drop of 3 million pixels. However, as is often the case with DSLR upgrades, what you lose on the swings you gain on the roundabouts. The Canon EOS-1D X offers improved handling - particularly for those who regularly shoot in upright (portrait) orientation - and has a maximum continuous shooting rate of 12fps. Let's take a closer look at what else the Canon EOS-1D X - priced at £5,299 in the UK and $6,799 in the US - has to offer. According to Canon UK's David Parry, the manufacturer opted for an 18.1MP CMOS sensor for the EOS-1DX to ensure higher image quality at the upper sensitivity settings than a camera with a great pixel count can muster. Because it's a full-frame sensor, we can assume that the photoreceptors (or pixels) are larger than those on one of Canon's APS-C format 18MP sensors. This should ensure better control of image noise and high sensitivity performance. It also means that the Canon EOS-1DX is compatible with EF mount lenses. In a first for a Canon full-frame sensor, the Canon EOS-1DX's sensor has gapless microlenses. This maximises the light-gathering potential of each photodiode, which helps reduce image noise levels and enable sensitivity settings to be pushed higher. According to Canon Europe's Mike Owen, the Canon EOS-1D X's photodiodes are 21% larger than those in the Canon EOS 1Ds Mark III. Again, this benefits image quality and helps keep image noise down, especially at higher sensitivity settings. Consequently, the Canon EOS-1DX has a native sensitivity range of ISO 100-51,200 and expansion settings going up to the equivalent of ISO 204,800. Two Digic 5+ processors handle the output from the Canon EOS-1DX's 36 x 24mm CMOS sensor. These enable shooting at up to 12fps with full autofocus and metering functionality, but if you are prepared to set the focus point and exposure before the first shot is captured it is possible to shoot JPEGs at up to 14fps. Like the Canon EOS 5D Mark III, the Canon EOS-1DX has a 61-point autofocus system. These points can be selected individually or in groups. 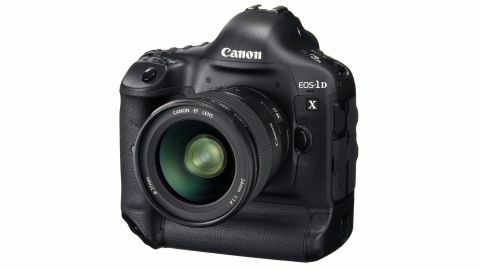 Although it has only recently come to market, the Canon EOS-1DX was announced months before Canon unveiled the hybrid AF system found in the Canon EOS 650D and Canon EOS M.
Consequently, in Live View mode the Canon EOS-1DX can use either contrast detection or phase detection focusing, but the latter results in an interruption of the live view feed, since the mirror has to flip down so that light is directed onto the AF sensor. One slight disappointment is that the Canon EOS-1DX doesn't have the rate button or in-camera HDR feature on the Canon EOS 5D Mark III. It is possible to rate images as they are reviewed, but it's done via the menu, which takes a little longer and is less intuitive. We still found it helpful to assign a rating out of five to images in the lull between shooting sessions in the photographers' pit at a music festival. We'd also liked to see the Canon EOS 5D Mark III's in-camera HDR system, which works with raw files and JPEG images and saves the three constituent images as well as the composite picture. Granted, most professional photographers know how to achieve this type of effect themselves, but the in-camera results are impressive and can be useful.